One can avail from us an aesthetically designed. Creatively crafted krishan moorti reflects the skills and creativity of traditional craftsmen. According to Hindu Mythology, Durga Mata is considered as goddess of patience, fearlessness and power. Iskon krishan moorti are carved in such a way that the blessings of Mata are directly provided to devotees. We utilize best quality marble blocks to carve these Durga Mata Statues and ensure clients for highest quality standards. We have established ourselves as a leading manufacturer, exporter, and supplier of various high quality statues. We offer Radha and krishna statue which is known for its superb design and elegant look. 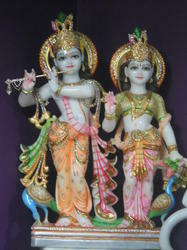 At economical prices Radha and krishna statue can be availed. We bring to you, the exclusive Radha and krishna statue. Radha and krishna statue has a thin, white marble platform, while the statues are colorfully decorated. We have come up with a comprehensive range of Radha and krishna statue, which are known for their excellent finishes and durability. Our range of statues include Laddu Gopal Statue, Lord Radha and krishna statue, Lord Krishna playing flute etc. These are designed with latest technology and machinery. Crowned with “Mayur Pankh Mukut”, which is made with attractive beats and coloured stones, we offer these statues in various specifications. 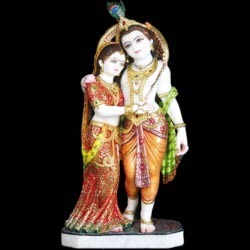 Our organization is engaged in offering a wide array of Radha and krishna statue , which are manufactured as per international quality standards. These are widely used in homes, temples, offices, schools, hospitals and more to worship God. We also provide these idols in various sizes, shapes and polishes. These are highly portable and thus give the real feel of Hindu Religion and tradition .We design and export our exclusive range of Radha and krishna statue that are known for their excellent finishes and optimum quality. These divine Statues gives positive vibes and thus chance the whole ambiance. Our range is highly demanded among our clients for their different styles, sizes and textures. These can be easily placed in temples, houses or offices, to get a closer view of Radha and krishna statue. These are beautifully designed with a combination of colours. We ensure the safe delivery of these statues to our clients.The statues of Radha and krishna statue are available in various dancing postures. The sets of Radha and krishna statue are beautifully designed and carved in white marble, red stone and black stone. The statue of Radha and krishna statue with ten faces of all the lords is the masterpiece by itself We are engaged in the designing of beautiful and elegant Radha and krishna statue. These Radha and krishna statue stand for the artistic excellence of our artisans and are widely appreciated for elegant designing. Our Radha and krishna statue are in demand for their high durability and long-lasting finish. The stylish posture of Radha and krishna statue is in demand for both decorative and devotional purposes. In the range of our most exciting and eye-catching products are also included these Radha and krishna statue. These Radha and krishna statue from marble have been named after its specially designed and carving which is done over the marble by our highly talented and skilled craftsmen. These Radha and krishna statue from marbles are widely in demand and use in almost all the parts of the country as well as various other countries and are considered as the lordess of wealth and income. We are offering these statues to our clients at a very reasonable range of prices. We have established ourselves as a leading manufacturer, exporter, and supplier of various high quality statues. We offer Radha Krishna Statue which is known for its superb design and elegant look. At economical prices Radha Krishna Statue can be availed. We bring to you, the exclusive Radha Krishna Statue. Radha Krishna Statue has a thin, white marble platform, while the statues are colorfully decorated. We have come up with a comprehensive range of Radha Krishna Statue, which are known for their excellent finishes and durability. Our range of statues include Laddu Gopal Statue, Lord Radha Krishna Statue, Lord Krishna playing flute etc. These are designed with latest technology and machinery. Crowned with “Mayur Pankh Mukut”, which is made with attractive beats and coloured stones, we offer these statues in various specifications.Our organization is engaged in offering a wide array of Radha Krishna Statue, which are manufactured as per international quality standards. These are widely used in homes, temples, offices, schools, hospitals and more to worship God. We also provide these idols in various sizes, shapes and polishes. These are highly portable and thus give the real feel of Hindu Religion and tradition .We design and export our exclusive range of Radha Krishna Statue that are known for their excellent finishes and optimum quality. These divine Statues gives positive vibes and thus chance the whole ambiance. Our range is highly demanded among our clients for their different styles, sizes and textures. These can be easily placed in temples, houses or offices, to get a closer view of Radha Krishna Statue . These are beautifully designed with a combination of colours. We ensure the safe delivery of these statues to our clients.The statues of Radha Krishna Statue are available in various dancing postures. The sets of Radha Krishna Statue are beautifully designed and carved in white marble, red stone and black stone. The statue of Radha Krishna Statue with ten faces of all the lords is the masterpiece by itself We are engaged in the designing of beautiful and elegant Radha Krishna Statue. These Radha Krishna Statue stand for the artistic excellence of our artisans and are widely appreciated for elegant designing. Our Radha Krishna Statue are in demand for their high durability and long-lasting finish. The stylish posture of Radha Krishna Statue is in demand for both decorative and devotional purposes. In the range of our most exciting and eye-catching products are also included these Radha Krishna Statue . These Radha Krishna Statue from marble have been named after its specially designed and carving which is done over the marble by our highly talented and skilled craftsmen. These Radha Krishna Statue from marbles are widely in demand and use in almost all the parts of the country as well as various other countries and are considered as the lordess of wealth and income. We are offering these statues to our clients at a very reasonable range of prices. 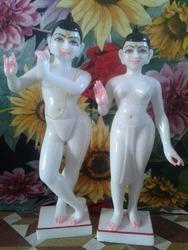 Looking for Radha Krishna Marble Moorti ?